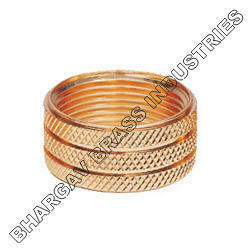 We are a leading Manufacturer, Exporter of Brass Inserts based at India (Jamnagar, Gujarat). Knurling Available: Diamond, Straight, Unidirectional. Range Available in Inches Thread - 1/8”, 5/32", 3/16", 1/4”, 5/16”, 3/8”, 1/2”, 3/4" or any size as per specification and drawing. Platting: Natural, Nickel, Electro Tinned Platted or any platting as per customer specifications. Any kind of special Brass Inserts for Injection Molding can be developed and supplied exactly as per customer specifications. We manufacture a wide range of Brass Knurling Inserts, which are available in different outer surfaces like Straight Knurling, Diamond knurling and Crossed knurling for better grip in plastic moulding. 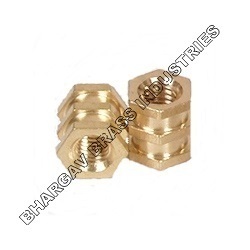 Also Brass Hex Inserts are available in our product range for customer special requirement. We also manufacture inserts as per customer's design and specifications. 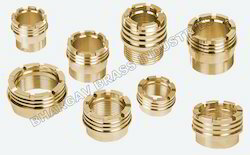 We are a leading Manufacturer, Exporter of Brass Ultrasonic Inserts. We are offering an excellent quality of Brass Ultrasonic Inserts. These Inserts are offered in variety of designs, lengths and thread sizes. Finishing : Natural, Nickel, Electro-tinned, Chrome platted or any coating as per Customer’s specification. We can develop & supplied any kind of special Brass Ultrasonic Inserts exactly as per custom design and specifications. 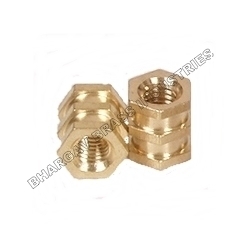 We are the leading manufacturers of Brass Inserts Fittings. We are highly capable to cater export enquiries. To ensure that our clients are provided with high quality finished products, we fabricate these products by using superior-grade raw material, obtained from the most authentic vendor of the industry. Moreover, these quality-assured products are manufactured in a sophisticated production unit with proper guidance of deft team of experts. 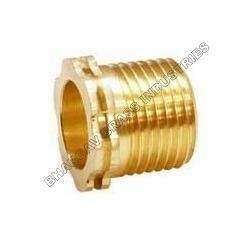 Brass Inserts for PPR Fittings are available in metric, UNC, UNF, BSW, BA, BSP, BSPT, ISO metric and DIN threads. Brass moulding inserts for injection and roto molding. Moulding inserts or moulding turned parts are also available as per customer's design and samples. Suitable for plastic moulding, PVC injection moulding and rubber moulding. Brass Molding Inserts are also most suitable for PPR Fittings as well. 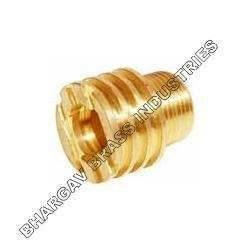 We are one of the largest manufacturer exporters of Brass moulding inserts from India. Steel ring also available. Sizes Available: 1/2", 3/4", 1", 1.1/4" , 1.1/2", 2", 2.1/2" , 3", in BSP,BSPT,NPT, and 22MM TO 8OMM threads. We will be glad to provide the sample as free of costs. 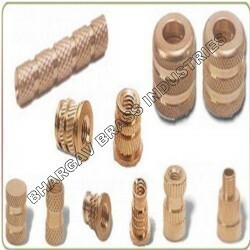 We Manufacturer of Brass Inserts For Plastic. 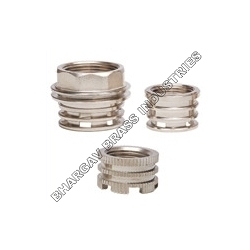 These Brass inserts are push fit type and are used in plastic molding. We offer a wide range of Brass Inserts for Plastic like Multi fit Inserts, Heat fit Inserts, Press fit Inserts, Screw fit Inserts, Mould fit Inserts and Roto fit Inserts as per custom designs. 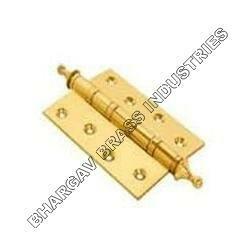 Any kind of special Brass Inserts can be developed and supplied exactly as per customer’s specification. 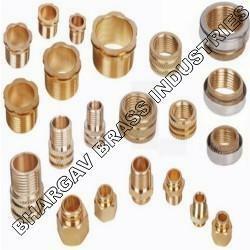 We are among the leading industries engaged in offering an exclusive range of Brass Insert for CPVC Fittings to our clients in varied sizes. Offered products are manufactured using high-grade quality raw material, in accordance with the industrial norms and guidelines. These fittings are appreciated widely for their resistance against corrosion and abrasion, dimensional accuracy and excellent strength. 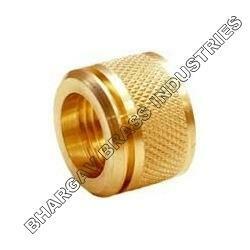 We are a leading manufacturer of Brass inserts for CPVC Fittings. Our Product suits for all type of Plastic Moulding and injection molding Industries. BSP for female inserts & BSPT for male inserts. Or any threads as per custom specification can be developed. Knurling Available: Diamond, Straight, Both blind and through inserts are available. 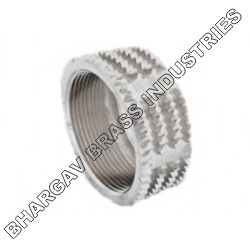 Natural, Nickle Platted, Chrome Platted or any coating as per customer’s requirement. 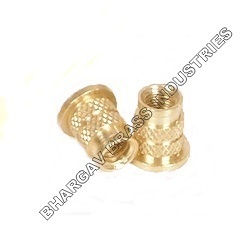 Any Kind of Brass Inserts for CPVC Fittings, Brass Male and Female Inserts for CPVC Fittings can be developed and supplied exactly as per customer’s specifications. 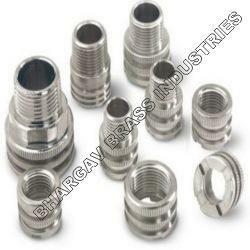 We are engaged in offering a comprehensive range of Brass Male Inserts to our clients at leading prices in the market. Offered products are manufactured using quality-assured raw material, procured from reliable sources of the market. Moreover, we make these products available to our clients in varied sizes, designs and other specifications and are also capable of customizing these products as per the clients requirements. 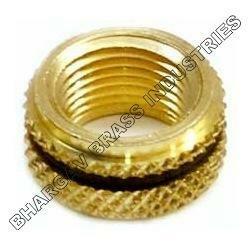 We are manufacturer of Brass Tappex Inserts as per custom design and specification. Our Brass Tappex inserts suitable for installation into thermoplastic, thermo setting plastic and metal materials. Threads Available in Inches - 1/8" , 5/32", 3/16", 1/4", 5/16", 3/8" , 1/2" , 3/4" , 1"
We are manufacturer of Brass Press-In Inserts. Our Brass Press In Inserts are used in Thermoplastic molding. It requires vary low screws installation torque and has self-locking action. Millimeter Thread Range - M2 , M3 , M3.5 , M4 , M5 , M6 , M8 , M10 , M12 , M16 , M20 , Inches Thread Range - 1/8" , 5/32", 3/16", 1/4", 5/16" , 3/8" , 1/2" , 3/4" , 1"
Molding / Knurling Inserts Moulding Inserts from size 2 BA, 3.5 mm, 4 mm up to 12 mm in round square & hex shapes. These are generally used in plastic moulded parts for electrical industry. With the constant support of our dexterous work force, we are offering a sustainable spectrum of Molding Inserts to our clients. The product we offer products are widely applied in various engineering related industries and other areas, these products are widely appreciated for their trouble free operation and zero defect finish. Bearing Hinges offered come in durable construction finish and can be made available in different finish configuration ad specification choices as per the specific demands. Featuring sand polished finish, these hinges provide for smooth opening and closing support and are made available in quality brass metal finish. Some of its features include different surface finishing choices like brushed gold, antique brass and others; standard opening size and axle diameters; square corners; superior texture finish over entire surface. We offer our esteemed clients with quality-assured Molding Inserts widely utilized in various engineering related industries and other areas, these products are widely appreciated for their optimum performance and seamless finish. We utilize optimum-grade raw material, sourced from the the most leading vendor to manufacture these quality-assured products. Looking for Brass Inserts ?